I thought i'd share a few black and whites i'm doing lately. The first one was my first black and white, and the first picture I got -really- excited about the turn out of. Driving out in the country towards Rio Vista, I happened to get turned down a long, badly worn road. Speeding along, I realized there was something off to the side of the road. 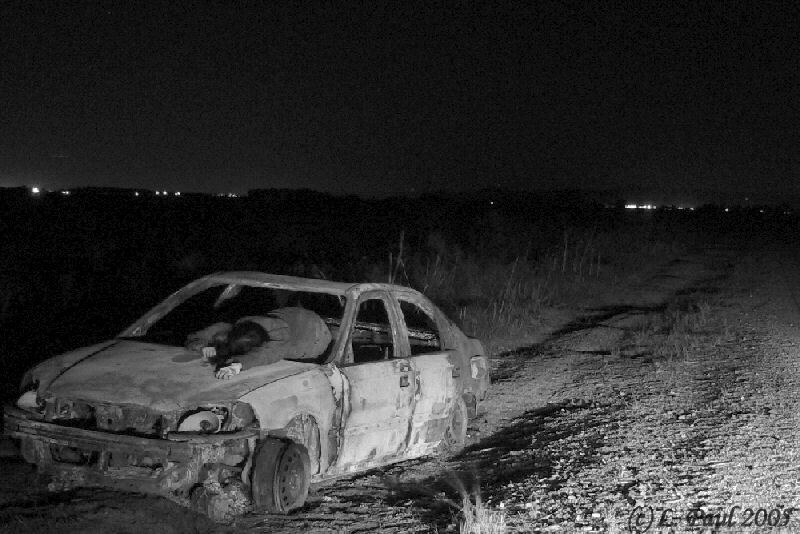 Slowing down, my headlights illuminated the rusted, skeletal remains of a burnt out car. Closer inspection showed that the small four door had been in a fire intense enough to burn the inside down to the metal fittings, and melt the windshield and windows in to a smooth, blackened surface that cracked over the weather ravaged shell. The thought for this picture came to me shortly after leaving, and having retrieved my camera, I enlisted the help of a friend to release the shutter after framing this shot. Light was provided by my car's headlights which accounts for the odd shadows, very high tech. An eight second shutter speed made me lay in the pose for this picture much longer then I wanted to be in that creepy husk. Taken in color, resized and Channel Adjusted to Black and White in PSP. No sharpening, might have done a minor contrast enhancement but I don't quite remember now. Settings escape me, other then I think the apeture was 7.3 at a pretty quick shutter speed. 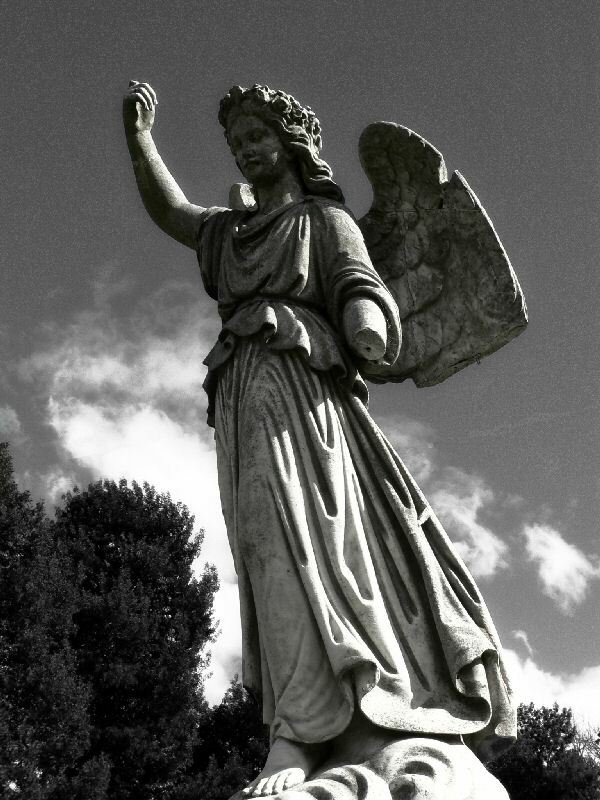 Taken in Oakland's Mountain View Cemetary in color and brought to Black and White with Flaming Pear's Mr. Contrast plugin. Last one. 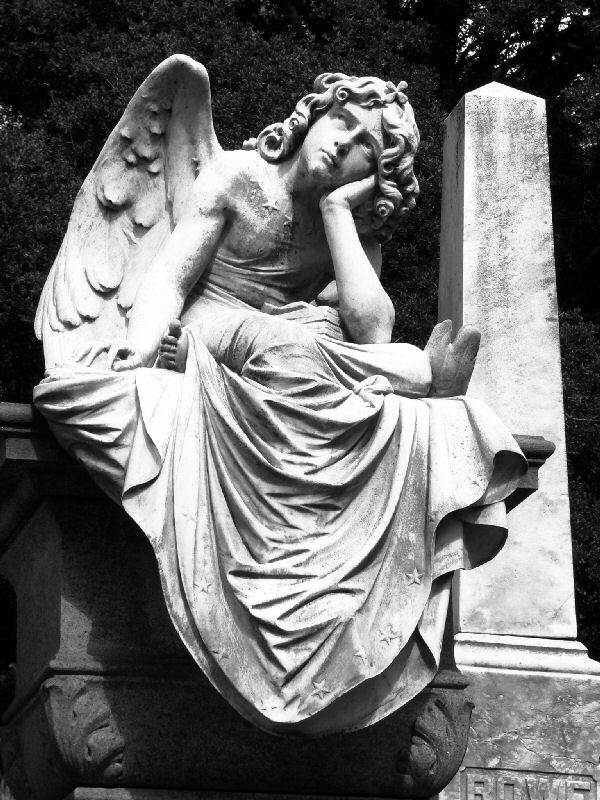 This angel statue's upward stare towards the looming grey clouds made me think he was wondering the same thing we all were. Are we going to get rained out again? With stars on the hem of his robe as well as looped about his collar, I took him in color and brought him out with Flaming Pear's Mr. Contrast again. I would appreciate any feedback on the pictures, I think I picked up some unnecessary noise in processing them to black and white with such high contrast. I'm still working on getting a good balance of the darkness I want and retaining the contrast that keeps my subject clear. Number 3 is nice - straightforward and expressive. Number 1 reminds me of a cheap black and white horror movie still - creepy! crazy idea for that pose too! Creepy statues. The third looks alive. The first reminds me of Night of the Living Dead for some reason. "They're coming to get you Martha..."
(edit) ... ah, yes! The burnt out pick-up scene, if you recall that film. That's why. I usually don't like how Mr. Contrast does B&W... but it works here for sure. Perfect!